We drove up a narrow street in Qaraqosh, Iraq, practically an alley, and our driver stopped the van when he could go no further. A large group of soldiers stood at the entrance to the church, as if on the lookout for something, and they eyed up our vehicle. They held their weapons nonchalantly, the way men might hold briefcases or umbrellas. Just as we came to a stop, a motorcade of cars strung their way through the alley. The also stopped beside the church. A group of people got out, and one of the men was dressed in the black garments of a priest or a bishop. He shook the hands of every soldier, of every person who approached him. He entered the church and was followed by a small crowd. We got out of the van. Walking in the street felt exposed, vulnerable. I glanced along the roof line of the surrounding buildings, but they were nothing more than rubble. There was no lone sniper, no incoming mortar. We followed the man and the crowd into the dark church. There were no lights, and the sky outside was gray, so everything was in shadow, but it was impossible to miss the blackened granite walls. ISIS had coated those walls in some kind of fuel, something that would burn for hours. The columns were not as charred but were covered in ISIS graffiti. The altar had been desecrated. Anything holy or symbolic had been shot to pieces. We walked through the church and into the courtyard where, again, anything beautiful had been smashed. ISIS had turned the courtyard into a firing range. There were reports of ISIS crucifying Christians in that part of Iraq, beheading children. 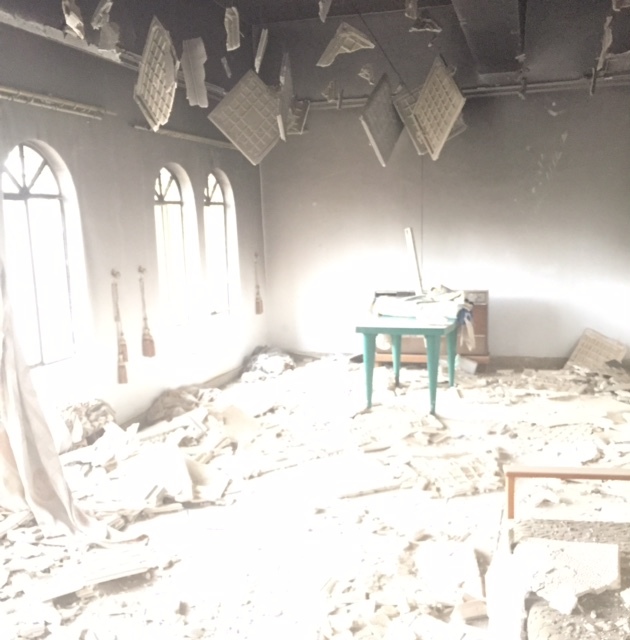 The church building itself felt like it was in mourning, weeping for what had been lost. We wandered around, stunned, feeling lost. A light drizzle fell from the sky, and something in me wanted it to pour, wanted the heavens to open and for a rain, no, a flood, to sweep it all away. All the burned things, all the disgusting symbols, all the bullet casings, all the memories of what had happened there. But no heavy rain fell. Only a light drizzle that blurred my glasses and sent us into one of the wings of the church. There, we found a priest and a nun rummaging knee deep in debris. The room they were in had been destroyed. Bunk beds lined the walls. I thought they must be looking for something valuable – they seemed so desperate to find whatever it was they were looking for. They moved rubble and ceiling tiles and plaster. Parts of the walls that had fallen in. All the closets had held was strewn on the floor. We asked them what they were looking for. The priest held up half of a flannel board. I walked out. Someone else in our group followed me, began to walk up the stairs. We went back in the room and we helped the priest and the nun look for their flannel board. There are still so many good people in Iraq, people looking for all the lost things. So many good people. We didn’t find the flannel board. We said we would send them one. Back in the courtyard, one of the soldiers asked to have his photo taken with us. We gathered together and tried to smile. The rain came down again. We walked out into the street, through the blackened church. the priest was leading the people in a church service, and they took communion. The street was lined with broken houses, destroyed buildings. The church’s steeple was nearly falling down. We got back in the bus, and they drove us out of that broken city. I sit on the floor again, another night in Lancaster. The boys are nearly asleep. The light outside is gone. I think back on my time in Iraq and it seems like a dream, or something I did twenty years ago, though it was only last month. I think of the people I met, and they are like characters in a book. But while I sit here in the quiet, the fan humming, over there they must live with their blackened churches, their bullet-strewn courtyards. Their nightmares. They must go on rebuilding, being good people, praying for peace. I pray for peace. I pray for peace. I pray for peace. But I know where God is. He is in Iraq. I saw him there, in the blackened church, handing out the Body and the Blood. I saw him there, in the wing of the church, searching for a lost flannel board. I saw him in the faces of the people filing in to attend the service. As we drove away, he waved good-bye, the hand of a small child in the street.